Horses evolved as a grazing animal, which means that they are meant to nibble on small amounts of food over the course of an entire day, and most of this food should be in the form of roughage, or hay. 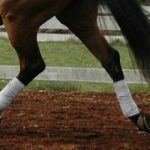 Roughage is one of the most important parts of a horses’ diet, and a good source of roughage can provide almost all of a horses nutritional needs, outside of water. Typically, fresh green pasture does just that, and many baled hays can meet these needs as well. 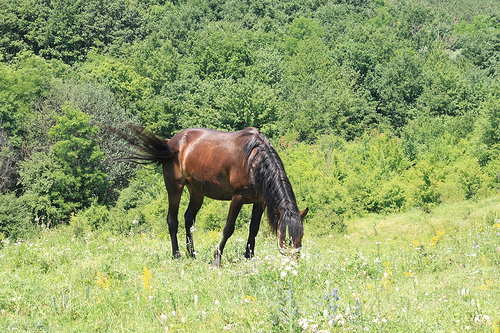 There are many different kinds of roughage that a horse owner can use to feed horses. Two of the most popular are Grass Hay (usually Timothy Grass or Orchard Grass) and Alfalfa Hay. And it is here that we enter into contentious territory. Sometimes it seems that horse people have as many opinions and feelings about feeding Grass versus feeding Alfalfa as there are horses in the world. Opinions as to which should be fed, when, and what is the right mixture of the two if they are combined. There are many, many myths out there, but here is the Truth about Grass Hay versus Alfalfa Hay. First off, for the sake of our discussion, we will be using some generalizations that are well accepted in the equine nutrition community. Equi-analytical laboratories analyze feeds for hay producers as well as horse professionals around the country, and their 10 year averages are a good baseline for nutrition values. Alfalfa Hay (also known as Legume Hay) averages 21.2% protein and 11% NSC (simple starches). Grass Hay averages 10.8% protein and 12.9% NSC. Alfalfa Hay is also higher in Calcium, with about 3 times as much as Grass Hay. This can become important when considering the ideal Calcium:Phosphorus ratio for horses, which should be about 2:1. The Calcium in Alfalfa is higher, but the Phosphorus is about the same as grass hay, which could lead to an imbalance in the diet of a given horse. In Colorado we tend to have some very good hay of both varieties grown here and a given batch of hay could exceed or undershoot these values, so it is important to remember that they are just generalizations. Feeding horses is never an easy topic to simplify since every horse is different. The horses’ age, activity level, breed, and stage of life can all have a tremendous affect on the amount of feed that they require. 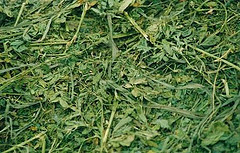 Alfalfa Hay, with its higher protein and adequate energy amounts might be the ideal feed for a hard working ranch horse, but it could be too rich of a feed for a retired backyard horse in the same amount. With this in mind, check out our previous blog posting here and here regarding how to feed your horse, and always measure the amount of feed that is right for your specific situation. makes their horses too “hot”. Others worry about the Calcium to Phosphorus ratio being too high. While neither of these things is an out and out myth, they come from misunderstood feeding principles. The impression that alfalfa makes a horse hot is usually the result of an improper amount of alfalfa being fed. This is because Alfalfa Hay meets most protein and nutrition needs with a smaller quantity than most Grass Hays do. This means that if you fed strictly what your horse needed for nutrients, your horse could still not feel full, since the amount of alfalfa that would reach these nutrient needs is not going to be the amount to properly fill the horse up or make them feel full. As a result, if you fed your horse enough alfalfa to make them feel full, then you would likely be feeding them too much energy in their diet, and they could certainly act “too hot”. While this has led to the thought that alfalfa is a “richer” feed then grass, it does not mean that it has more carbohydrates. And in fact, it is usually a lower carbohydrate feed than most grass hays, making alfalfa ideal for feeding to horses with special needs like insulin resistance, metabolic syndrome, laminitis, or even PSSM. Grass Hays are generally lower in overall nutrition than alfalfa hay, but this makes grass hay ideal to meet the needs of filling a horse up and making them feel full, while still meeting their nutrient needs. While grass hay is lower in protein and calcium it is still a great source of feed for most horses. While the lower relative nutrition level of grass hay makes it a good filler, it does have relatively more carbohydrates. This means that grass hay, not alfalfa hay, is a more dangerous food for an obese horse, or a horse with laminitis concerns. This is counter intuitive for most horse people, but is certainly something to keep in mind in regards to your horse. So, there are pros and cons for each type of hay, and good reasons why a blend of the two, or even 100% alfalfa or 100% grass hay could ideally meet your horses’ needs. If you have additional questions, or want to discuss a feeding program tailored to your horse, contact your veterinarian.